Books I have written in recent years and where you can buy them (I do not profit from their sale). New for 2018. 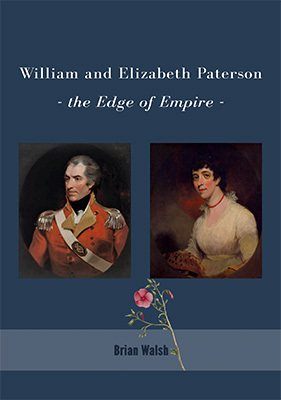 A fresh look at the first two decades of Australia's European history through the lives of William and Elizabeth Paterson. Framed by imperial ambition and ideals of the Enlightenment, these two spirited Scots stood at the centre of the achievements and disdeeds of the NSW Corps during its time in Australia. William became colonel of the regiment and acted as governor of NSW for two separate terms. He particated heartily in the trading activities of the Corps that earned the nickname "the Rum Corps", and he supported his officers when they deposed William Bligh and formed a rebel government. Elizabeth Paterson was an independent, talented woman who refused to live in William's shadow. She and her friend Anna King established the Sydney Female Orphan School, the first welfare institution on mainland Australia. They became the first women in Australia to serve on a government committee and to manage a pubic institution. William and Elizabeth Paterson founded what is now the city of Launceston in northern Tasmania. The book challenges the tired old populist views of the Rum Corps and the Rum Rebellion and offers a fast-moving, critical alternative to this extraordinary period in Australia's European history. Price is $45, available from McDonalds Bookstore in Maitland and from Paterson Historical Society. [224 pages, 2018, ISBN 978-0-6482580-0-1]. 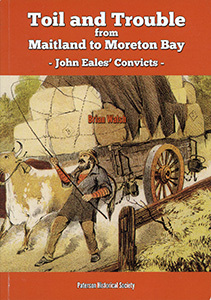 This book details the lives, deeds, misdeeds and adventures of 141 convict men and women who worked for John Eales of Berry Park and Duckenfield at some stage during their sentences or while holding a ticket-of-leave. Workplaces included the lower Hunter Valley, the Liverpool Plains and Wide Bay (in what is now the Maryborough region of Queensland). The book includes chapters on the Newcastle Female Factory, escapes and punishments, and convict life on Eales' squatting runs in the remote interior. In 2016 Toil and Trouble was short-listed for the Kay Daniels Award made by the Australian Historical Association to recognise outstanding original research on Australian convict history. Price is $25, available from McDonalds Bookstore in Maitland and from Paterson Historical Society. [96 pages, 2014, ISBN 978-0-987144-0-6]. Details of the individual convicts are available here. 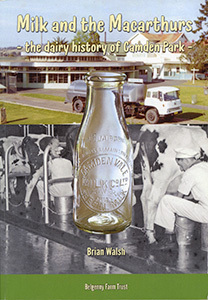 Chronicles the dairy history of Camden Park under the Macarthurs, including the early days of the Cowpastures, production of Laurel butter, Camden Vale Special Milk, model dairies and the famous rotolactor at Menangle. Available from Belgenny Farm. [128 pages, 2016, ISBN 978-0-9946250-0-7]. A fascinating account of the first Europeans to settle outside the Sydney basin. 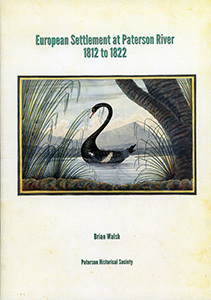 Reveals the operation of the Newcastle penal settlement, the benevolence of Governor Macquarie, life on the Paterson River, the remarkable local economy and the struggles of the early convict settlers to keep their land. 48 pages. Available from McDonalds Bookstore in Maitland and from Paterson Historical Society. 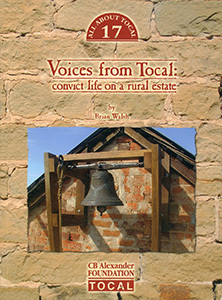 [48 pages, 2012, ISBN 978-0-9871744-3-7]. Available from McDonalds Bookstore in Maitland and from Tocal College. [142 pages, 2008, ISBN 978-0-73130610-7].